Our bodies have the innate ability to heal themselves. Our red blood cells, white blood cells, our neurons and the many biological systems which make up the body, all have the capacity to heal or restore themselves to their original state of well-being. In the modern day, humans have come to reply on science and medicines such as pharmaceuticals, to heal our ailments and restore the proper functioning of the body and its systems. The physical vehicle that is our body, is not just made up of the physical aspects such as organs, endocrines and body parts, but includes the senses, consciousness and the subtle energies, such as the chakra’s and meridians, all of which have equally as great an effect on our health, as the physical aspects of our body, if not more. Modern day quick fixes usually address the symptoms of illness of our discomfort and illnesses however modern societies have forgotten what the ancient societies knew to be true, and that is that the most effective approach to healing and well-being of body and mind, is a holistic one. One which looks to illness in the body as not just a set of separate and isolated ailments, but rather to the whole entity, every cell, which works in co-operation with every other cell in the body. Mal Weerarante, founder of the Tantric Journey School of Healing and Awakening, based in west London, and author of ‘Emotional Detox – A Woman’s Guide to Healing and Awakening’ is the world’s leading modern Tantric healer. Mal Weerarante explains how negative emotions result in trauma which can become stuck within our body as molecules of emotions at cellular level. These molecules of emotions become stagnant in the body, affecting the energy pathways to such a degree that an individual may start to experience anxiety, sadness, depression and ill-health. 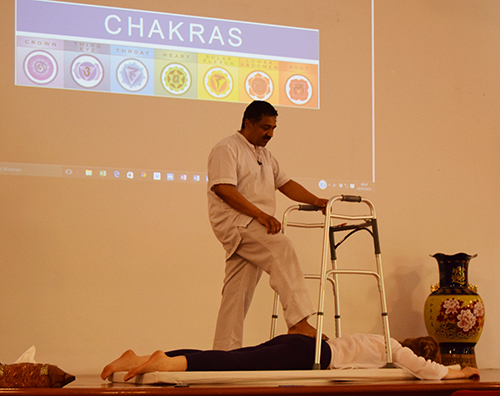 Mal Weerarante’s unique spiritual practice utilises Tantric–Tao bodywork to release emotional and physical blocks which have become stuck within the body. This technique is a simple and effective holistic approach which is designed to help individuals to awaken their true selves and expand their consciousness. Focusing on just three aspects: breathe, sound and body movement, Tantric positively assist individuals to experience improved health, wealth and happiness in relationships and within themselves. Mal has studied Tantra and Tao for more than 20 years and now shares his unique bodywork healing methods with men, women, individuals, couples and healing practitioners around the world, displaying how his methods can help people to heal and restore themselves to their natural state of bliss, which is our human birth-right. As a result of western influences and belief systems, women fail to realise their natural state of emotional freedom and ecstatic bliss which they may experience through the female body. The female body has the capacity to rejuvenate and realise its full spiritual potential through the practices of tantra which eliminate the negative feelings, beliefs and traumas which we harness while returning us to our natural state of unreserved well-being allowing us to reach our highest potential. Mal Weerarante’s intensive Emotional Detox through Bodywork will help you to discover how to enjoy your own individual tantric spirituality and free yourself from limitations.